Urban parks are often overlooked when it comes to enjoying some outdoor adventure. While “escaping the city” is always great, sometimes you need a quick fix in your own backyard. If you happen to live in Western New York, then the Tifft Nature Preserve is one such local option. A quick drive or bike ride to the outskirts of Buffalo and you find yourself at this 264-acre nature oasis, that was once used as a shipping area for coal and iron ore. It was also used as a landfill for some time. Today, nature has taken over much of the area. Ponds, boardwalks and hiking trails create a nature escape, within eyesight of the city of Buffalo. The thought of nature and Buffalo going hand in hand may seem strange, but it truly works at Tifft, where they run frequent sessions with schools to educate kids on the plant life and wildlife of the area. The visitor centre is full of old photos of the area before it was a park and includes a great little library collection to help you identify what birds or animals you’ve seen on your hikes. 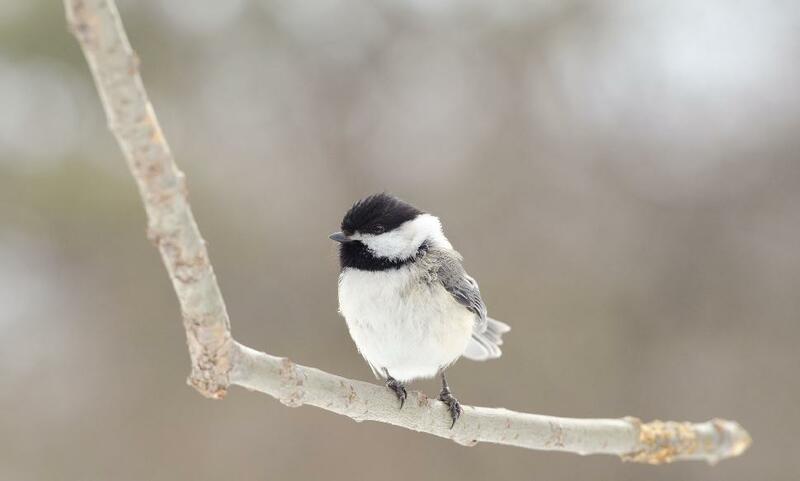 As for the wildlife, in winter most visitors have great fun with the chickadees as they’ll land on your hands if you have some sunflower seeds for them to eat. The main trails are hard-packed enough in winter for hiking, but snowshoe rentals are available as well – a great place to try snowshoeing for the first time if you’ve never done it before! Trails here are fairly flat, winding around the ponds. If you visit on a week day or time when it is not so busy, you may get lucky and spot some of the bigger wildlife in the park, including deer! 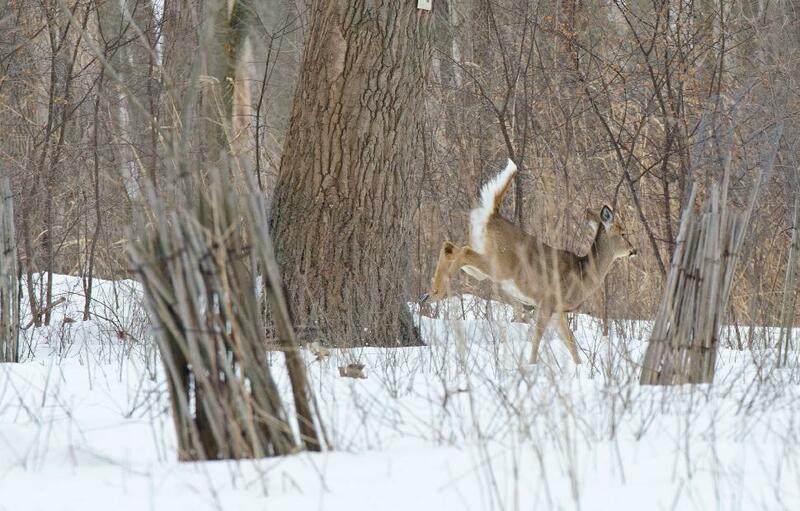 Who would have imagined seeing deer just outside of Buffalo? While winter presents good snowshoeing and cross-country skiing options, the boardwalks and ponds come to life in summer, with frogs, fish and other aquatic creatures entertaining visitors, not to mention a wide variety of birds. There is a total of 5 miles of trails at Tifft Nature Preserve, and birders enjoy the area as it has a couple of blinds for viewing wildlife without disturbing the animals. Boardwalks wind around parts of Beth Pond, Berm Pond and Lisa Pond, while the visitor centre is on the larger Lake Kirsty. One of the better hikes is to start at the visitor centre and head to the main trailhead. Once you cross the bridge, go right to take the Snakeroot Trail. Follow that to the Boardwalk Trail that takes you to Berm Pond. Watch for plenty of small animals along the shores of the pond. Taking the boardwalk trail all the way around will allow you to either head back towards the visitor centre, or continue on further to Lisa Pond and the Rabbit Run trails. I visited in winter and was surprised by how many animal tracks could be seen around the ponds. Beavers are sometimes seen here, and everything from warblers to gulls to herons to owls have been spotted in the preserve. It was officially designated an Important Bird Area in 1998, with more than 250 species being recorded to date.